In general history is believed to be more misused and abused in process of reconstructing. Philosopher speaks of the truth in moral sense, poet in fictional sense, historiographer in context of event and interpretation. However within the profession of architecture the reconstruction of historical truth is often about nationalism, identity, strangely framed within the acute form Vs wider form of parochialism. Unlike socio-political thinkers like Hegel and Karl Marx came forward with a theory that historical processes proceed according to ideological, material or class struggle. The knowledge of history interprets and illuminates the human activity through variety of manifestation. The knowledge that is reflected the state of society and thus in institutions that has grown from it. The transformation of an institution reflects the modesty, priority and freedom of choice. The institution is a biology of society, metaphorically elucidates the process of ideological stand in survival, choice and breeding. The evolution of institution and its framework can be traced in its political history, constitutional history, economic history, social history. The social history is reflected in origin and development of institutions progressing towards rationality. As social history is more comprehensive in nature and G.M.Trevelyan correctly pointed out that social history as “the daily life of inhabitants, economic relationships, attitude to nature, conditions of various class, culture of each era and its value, changing form of religious practices ,literature” which are intricately reflected in architecture of history of institutions. The second year project attempt to relocate the role of institutions in its trajectory of evolution. The evolution and growth of institutions is slow and subtle in nature, obeying its own law, hence influencing & shaping the social and political sphere. In short the institutions are an expression of societal ideas for its existence and sustenance. The institutions reflects the descriptive geography and its ideological stem reflects the narrative of historical evolution, within which the notion of identity attempting to fill up the circumference of our perception, limited geography of space and its relationship with society. Hence identity is a trajectory of perception whose history is embedded in phenomena and reference to time where architecture has limited scope to arrest the phenomena and its reference to time as a tool to arrest identity. The project brief has potential to extend into a larger discourse and perhaps question the notion of identity, breaking the monolith, recapturing the porosity of unyielding space. Dahanu is a small town, approximately 60 kilometer from Virar. It is also well connected by Local trains and due to train connectivity, the place has visible transformation in last two years. Traditionally the place is known for Chikoo plantation, due to abundant water resources and soil condition. The majority of of the land resources are reserved for either for Chikoo plantation or forest. The frequent visit to dahanu for house construction site visit has revealed the living dimensions of the town in manifold. The agrarian society, adivasi settlements, reserve forest, industrialization of non agricultural land, privately owned farms along with the earlier inhabitant of the city, broadly defines the character & landscape of the town. The bi linguistic nature of local habitant makes the place unique as majority of them are Maharashtrian and Marathi speaking population, yet conveniently adopted Gujarati dialect. It also has revealed the various social entrepreneurs that existed within the central and periphery of the town, attempting to contribute to social development of either by skills, traditional cultural and social values, education and health. One of the organization is run by Mr. Babu, who is attempting to contribute to social development through education of adivasi children through innovative system of school academics. The campus is located in skirt of dense vegetation, touching large water stream, partly in reserve forest and partly habitable land. The school imparts education up to 8th standard in English. However the real difference is in the method of educating children through holistic system revolves around making/doing and learning. The students are required to come at eight in the morning and leaves late in the evening. The books, food, study & sports material is supplied by the schools. The students engages into agriculture, cooking, and all other activities that are part of their daily life. As part of their everyday activities, the building of campus infrastructure is also incremental in nature, i:e, build along with study. The typology of building also demonstrated the bare minimum-ness along with surprising accuracy of detailing. The material canvas is restricted to bricks, mats, metal and manglore tiles. The house also stated stoic simplicity with intricate understanding of construction and details. The load bearing walls, recycled wooden roof, doors and windows, courtyard, terrace garden, all of them on first glance appeared to be template of sensitive architect. But the entire house is build by the owner with help of labours, along with bricks moulded and baked in situ, doors and windows, roof are entirely recycled. The finishing materials are Kotah stone, yellow oxide floor. The last conversation with the owner on his understanding on architecture revealed the basic trait that " building has to breath" instead of ventilation. The word breath is metaphor of existence and architecture is essential part of existential reality. The last detail that missed out completely was the roof was detached from wall, allowing glow of day light scooping, and en living the space, making architecture worthy of its existence. The current semester II explored the housing studio as housing typological formation, its delivery system and responses to the various regional and environmental conditions which shall be affected by Delhi- Mumbai industrial corridor. The initial group study of Jaipur and Vidyadhar nagar explored the various geographical aspect that connects the urban form as large and as a result typifies the housing forms. 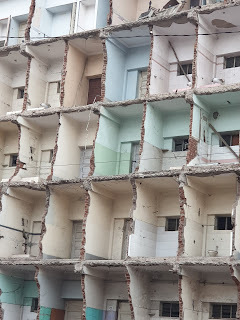 The subsequent three site conditions (Jaipur, Palanpur, Bharuch) adds to the immense diverse conditions in design process, raising the expectation to be responsive to the existing settlement patter, environmental constraints and attributes, livelihoods, various possibilities of delivery systems. Inshort the divers site conditions sets an diverse/ appropriate response to specific ecological and socio-economic contexts which were required to have diverse articulated methodology for mapping, analysis and strategy making. The interesting aspect of the studio that revealed the diverse forces that may get influenced by the perhaps uniform policy of industrial corridor and edge out the local responses and needs that ought to be integrated in overall vision plan. The Jaipur case revealed the land acquisition policy based on incentive model, yet ignoring the geographical constrained, its people, livelihoods. As a result one can see the strange yet remorseless nature of development attempting to iron out the social and morphological tendencies of our cities. The Palanpur site demonstrated the agrarian based thriving economy, which may not have any stake in the overall corridor plan. The agrarian economy needs its own set of attributes that facilitate the development and its contribution to the overall vision. The Bharuch site clearly seeks the gentry & task forced based housing conditions and needs infrastructure and amenities subservient to its own traits. It is perhaps clear the cities that are emerging along the corridor shall conveniently overlook the micro networks and indigenous properties of each site conditions to have strange template based urban development of tomorrow.
" City needs Housing or Housing needs City"